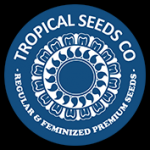 Tropical Seeds - Heaven's Gate CBD Feminised Seeds. Free US delivery. Heaven's Gate CBD is a super new medicinal marijuana strain which has two high CBD parents, namely DanceHall Mapetit x Pennywise the result of which was then back-crossed with Dancehall. This prized strain grows with a sativa-type structure and delivers high yields of large, airy, sativa-like buds. Flowering this strain will take approximately 70 - 75 days and it grows both indoors and outdoors. Heaven's Gate CBD exudes strong citrus scents which include orange peel and citronella including sweet candy and diesel notes. Its effect is 100% medicinal with low psychoactivity and a clear feeling of great lucidity without any compromising heaviness. This makes it perfect for medical users at any time of day or night. CBD-rich strains such as this are proving to be very popular for the production of therapeutic oils and creams.